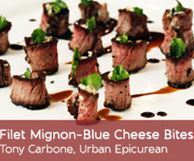 Thanks to Personal Chef Tony Carbone of The Urban Epicurean for showing how elegant cocktail party appetizers can be easy and stress-free! Olive oil is flavored with fragrant peppercorns, and used to encrust pieces of filet mignon. The beef gets a quick sear, and assembly is a snap — thin slices are rolled with blue cheese and greens and drizzled with reduced balsamic vinegar. Heck, you can even make these beautiful bites ahead of time and serve them chilled!